We would like to tell you the tale of the evil Medieval Engineer who became king after his good brother slipped on a banana peel and broke his neck, banished his deceased brother’s children from the realm, doubled taxes across the land (hence the angry barbarians who are in a perpetual state of rebellion against the crown’s new taxes), and banned the mead machine from the Engineers break room. Okay, so none of that actually happened. And for the record, the aforementioned tale of the evil Medieval Engineers king is not official Medieval Engineers lore. 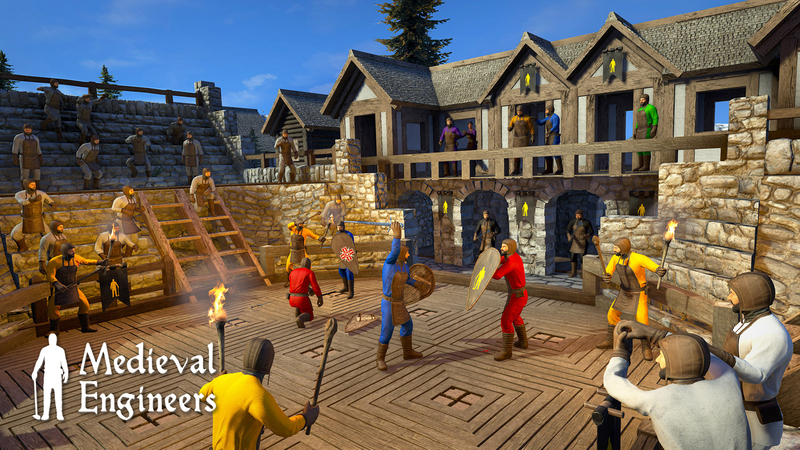 However, what is official is that we’re very excited to announce The Grand Melee! What is The Grand Melee? Dates: Saturday, November 10th, 2018 & Sunday, November 11th, 2018. Times: Beginning at 1 pm UTC and ending at approximately 4 pm UTC each day. Please note: Tournament matches may last longer or shorter than expected. 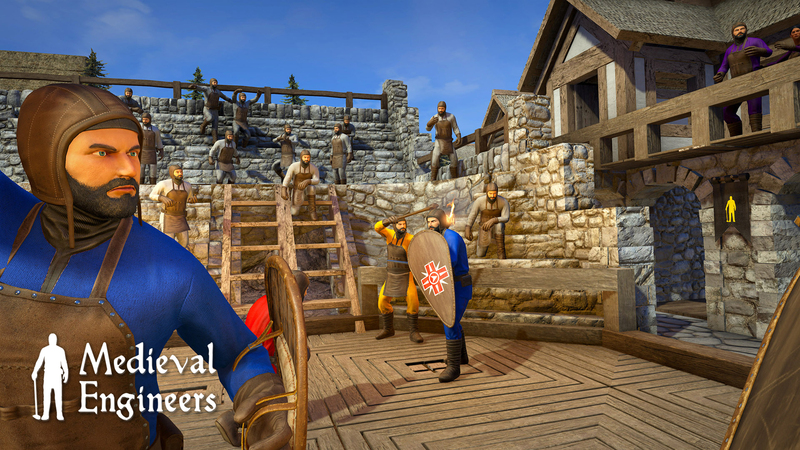 Location: Keen Community Network Twitch channel, https://www.twitch.tv/keencommunitynetwork and the Medieval Engineers YouTube channel, https://www.youtube.com/channel/UCChcFgm67v5tBdRbeBgC8XA/featured. Brackets: We are planning to have multiple brackets for the tournament. However, this is a tentative number, as we need to see how many people sign up for the tournament. Elimination Matches: The tournament will be running best-of-3 matches, and the eight finalists of these multiple brackets will compete in a double-elimination finals bracket. Deadline: registration for the Grand Melee will close on Tuesday, October 30th, 9:59 pm UTC. -Description: If you want us to introduce you in a specific way on the stream, you can leave a short description here. We retain the right to introduce you as we wish, but you can leave a suggestion. -Skill level/Hours Played: Boast about your abilities, taunt your opponents and you can put some flair here. - Email address: So we can contact you if you win the tournament. - Steam ID: Go to https://steamidfinder.com/ and fill in your Steam ID 64 number, we need this for the tournament server whitelist. - Banner Mod: If you already have a banner in a mod, let us know the mod steam ID(s) so we can load them onto the tournament server, but if you don't have any, leave this blank. All aboard the swag train! -A signed Medieval Engineers poster. -Your custom banner added to the game. -A screenshot of how your banner looks in the game. -A background image, 512x512 PNG file. -The screenshot should have a minimum resolution of 1080p, but the higher the resolution (4K for example), the better! -You must not use copyrighted material in your banner designs. Keen Software House will automatically be granted the right to use and modify any and all entries for any and all purposes, whether or not the entrant is declared a winner. Keen Software House can reject a banner if it is deemed to be inappropriate for the game and tournament. and ending 30/10/2018, 21:59 UTC. The winners will be announced on 12/11/2018, 13:00 UTC. 4. How to Enter: The Campaign must be entered by submitting an entry to https://battlefy.com/keen-software-house/the-grand-melee/5bbb68d83f085f03a1410e40/info?infoTab=details. The entry must fulfill all Campaign requirements, as specified, to be eligible. Entries that are incomplete or do not adhere to the rules or specifications may be disqualified at the sole discretion of Keen Software House. 5. General guidelines: Banner submissions for the winners of the Grand Melee (1st, 2nd & 3rd place) must include: a screenshot of how your banner looks in the game, a background image, 512x512 PNG file, a foreground image, 512x512 PNG file, the screenshot should have a minimum resolution of 1080p, and you must not use copyrighted material in your banner designs. Keen Software House will automatically be granted the right to use and modify any and all entries for any and all purposes, whether or not the entrant is declared a winner. 6. Prizes: The Winner(s) of the Campaign (the “Winner”) will have their custom banner added to the game. The specifics of the prizes shall be solely determined by Keen Software House. The prize is non transferable. Any and all prize-related expenses, including without limitation any and all federal, state, and/or local taxes, shall be the sole responsibility of the Winner. No substitution of prize or transfer/assignment of prize to others or request for the cash equivalent by Winner is permitted. Acceptance of prize constitutes permission for Keen Software House to use and or/modify Winner’s name, likeness, and entry for purposes of advertising and trade, on the Keen Software House website and social media accounts, and in Keen Software House games, without further compensation. 7. Marek Rosa CEO, Creative Director, Founder, Keen Software House CEO, CTO, Founder, GoodAI will officially carry out the duties of Winner Selection and Notification: Winner will be selected by Marek Rosa. Three winners will be notified via email at the end date of the tournament. Keen Software House shall have no liability for any Entrant’s or Winner’s failure to receive notices due to spam, junk e-mail or other security settings or for Winner’s provision of incorrect or otherwise non-functioning contact information. If Winner cannot be contacted, is ineligible, fails to acknowledge the prize, or fails to timely return a completed and executed declaration and release as required, the prize may be forfeited and an alternate Winner selected, or Keen Software House will automatically be granted the right to use and modify the entry for all purposes. Receipt by Winner of the prize offered in this Campaign is conditioned upon compliance with any and all federal, state, and local laws and regulations. ANY VIOLATION OF THESE OFFICIAL RULES BY WINNER (AT KEEN SOFTWARE HOUSE’S SOLE DISCRETION) WILL RESULT IN WINNER’S DISQUALIFICATION AS WINNER OF THE CAMPAIGN, AND ALL PRIVILEGES AS WINNER WILL BE IMMEDIATELY TERMINATED. 12. Sponsor(s): The Sponsors of the Campaign are Keen Software House, located in Prague, Czech Republic and ServerBlend, registered in England and Wales.